In this estate of 1000m², you will find 3 nice and comfortable holiday cottages to spend a splendid holiday with friends or family. *The holiday cottage Anastasio is a construction of 70m². * Two single beds (90x1.90) in each room and one sofa-bed in the living room-kitchen-dining room. * Two bathrooms: one with shower and the other with bathtub. * Living room-kitchen-dining room with chimney. * Kitchen equipment: coffee maker, large oven, vitroceramic, refrigerator-freezer, washing machine. * TV, radio and CD. * Private pool (5,5 x 2). * Barbecue area with terrace table and chairs and sun beds. The Rural House Anastasio is located in the Villa de Mazo, also called Villa of Corpus Christi for its day is celebrated with singular devotion here, making tapestries, bows and carpets artistically decorated with plant products, in which the art and the dexterity of the men and women of this village are reflected. Mazo is an eminently agricultural and rural village, like all of the island of La Palma, but it is also a cultured village; many illustrious sons have emerged from it, who feel very proud of being “mazuqueros”. The handicrafts play a fundamental role between its people, especially for women, who are famous embroiderers. In town, there is a crafts school where classes are given in various forms. In the Hoyo de Mazo, in Molino, Ramón and Vina have a pottery studio where the unique aboriginal pottery is faithfully reproduced. Its main agricultural wealth is the wine, specially the famous “red wines of Hoyo”, which are marketed by an association if wine growers. In the temple of its patron, San Blas, is a beautiful building with three naves from the sixteenth century. The Villa de Mazo is a traditional craftsmans’ village. An example of it is found in the arches and carpets that adorn the streets of the town during the festival of Corpus Christi, declared of National Tourist Interest, and from which we can enjoy as an example in the Red House Museum, next to some samples of embroidery. 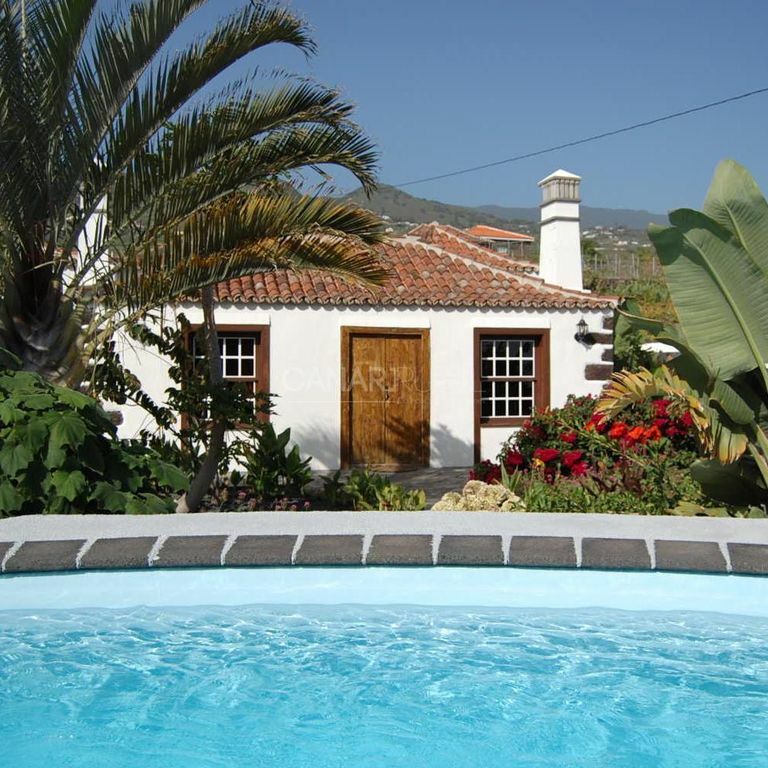 *The holiday cottage Anastasio is a construction of 70m². * Two single beds (90x1.90) in each room and one sofa-bed in the living room-kitchen-dining room. * Two bathrooms: one with shower and the other with bathtub. * Living room-kitchen-dining room with chimney. * Kitchen equipment: coffee maker, large oven, vitroceramic, refrigerator-freezer, washing machine. * TV, radio and CD. * Private pool (5,5 x 2). * Barbecue area with terrace table and chairs and sun beds. La casa te transporta a otra época , es una casa antigua con todas las comodidades del presente , sus jardines preciosos con todas su flores y árboles frutales . Es mucho más bonita que en Las fotos . Nos a gustado mucho y sin sudarlo la recomiendo . Tamaño perfecto, todo limpísimo y en buen estado. Servicio genial. Muchas gracais en especial a Brígida. Wir haben uns hier sehr wohl gefühlt. Alles notwendige war vorhanden. Jederzeit wieder! !